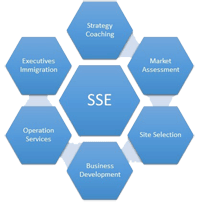 In the second step, we work with our enterprise partners to answer several questions. The answers to these questions are vital for potential success in the U.S. market. Clients need to know their target markets: the best prospects, the best areas for those prospects, and how likely those prospects are to invest in new products or services. Clients also need to identify their main competitors: their names, their own levels of success, and their strategies. Finally, clients should also be aware of any areas or needs that are not being met, areas and needs that make their venture stand out in the market. 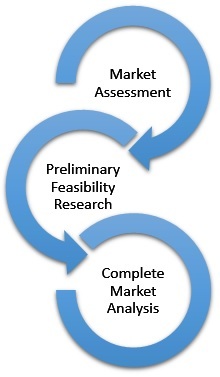 Feasibility research looks at secondary sources of information to gather a first round of data that can help our clients make the best decisions for their businesses. This quantitative and qualitative information is assembled into a report which informs clients of what likely awaits them in the United States in terms of business environment and the market. So that we can effectively analyze potential competition, potential market size, and the market’s needs, we must first gather specific information. Market information, which informs us of supply and demand and commodity prices, is found in a variety of sources. Market segmentation is an important part of our market research. It is the result of dividing a population or market into smaller groups that have similar reasons for acting, purchasing, etc. This segmentation can take place along lines of demographics, psychographics, geography, gender, personality, or product use. Trends in a market can be noted as that market moves down or up during a specific period of time. For our analysis, market size figures will come from the amount of possible customers.